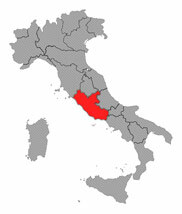 Lazio is located in Central Italy and has borders with Tuscany, Umbria, and Marche to the north, Abruzzo and Molise to the east, Campania to the south, and the Tyrrhenian Sea to the west. Its capital is Rome. Due to its immense popularity Rome attracts most of the visitors to the region, while the rest of Lazio is often overlooked. However, Lazio is a very rich region and a destination of choice, with its picturesque little coast towns, Etruscan relics and Roman architecture, historic villas and gardens, and a beautiful countryside with lovely little villages. 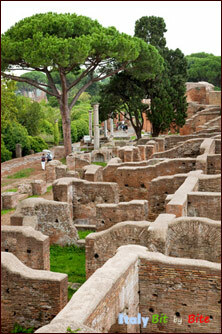 - Roman art in Tivoli, Ostia, Anzio and Gaeta. - Sperlonga is a beautiful, picturesque, little coastal town. The coastal towns of Anzio and Gaeta are also very pleasant little towns. - Tuscia: a historical region that corresponds more or less to the province of Viterbo and comprises a lot of charming little towns and Etruscan relics. 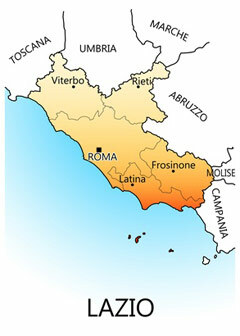 - Sabina, a historic-geographic region located between the Umbria, Lazio and Abruzzo regions. Lazio has a mediterranean climate, but the region climate's presents a high variability from area to area; the coastline has a true Mediterranean climate, while the Apennines mountains area gets cooler. Some towns, which are located on a promontory, such as Anzio, have a micro-climate, more pleasant in Summer than the hot temperatures of Rome, and milder in Winter. 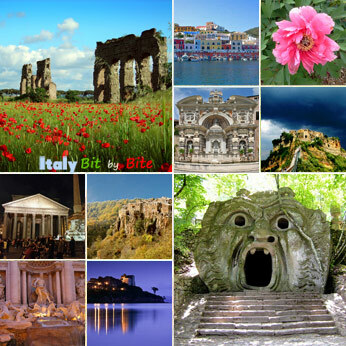 The Lazio region also counts a number of beautiful parks and gardens, among which the mannerist Park of the Monsters of Bomarzo, the Parco Nazionale del Circeo, the Riserva Naturale Lago di Vico, the Parco Nazionale del Gran Sasso and the Parco Naturale Regionale Monti Simbruini. The Moutan Botanic Garden with its unique collection of peonies at Vitorchiano (Viterbo) opens its doors to visitors in April and May each year. That is when peonies are in full bloom. The 15-hectare estate hosts 200,000 Chinese tree peonies representing 600 different varieties, some of which extremely rare.